Ogata Gekko (active 1874 - 1897) The Flowers of Japan: Sakura-ga-ike Lake, 1896. Oban. This very fine woodblock print commemorates the apparition of the Dragon King to a holy man, Honen (1133 - 1212) at lake Sakura-ga-ike. These lakes in the mountains, often with attendant hot streams or caves are frequently associated with the appearance of dragons and deities. In the case of dragons, I assume the coils of smoke must make some association with legend. This story of a Buddhist erecting a shrine at a Shinto site is probably typical of religious conversion at the time, this print a late reminder of such things. Of course, with these Gekko prints, the quality of the printing is quite outstanding. When holding these beautiful things it is hard to imagine that these delicate, fleeting designs are produced from simple, unyielding blocks of hardwood. 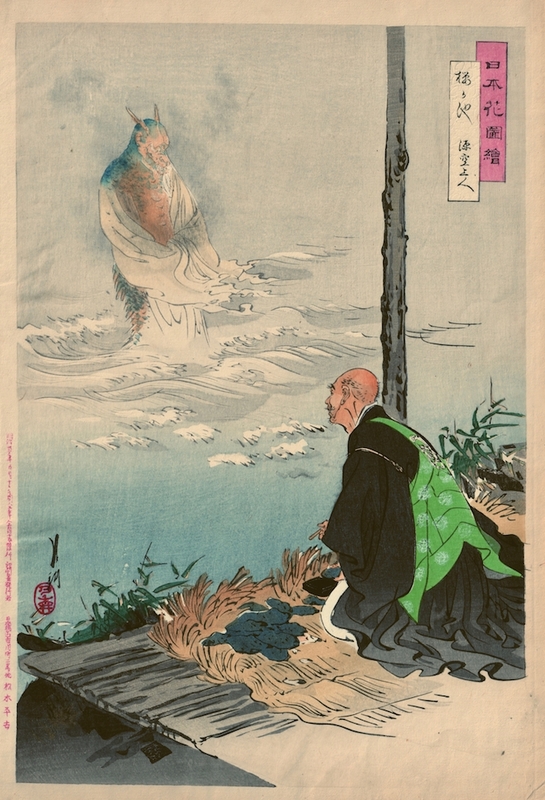 Gekko shows the priest kneeling towards the apparition of the Dragon King, who rises from the misty surface of the lake. This is the second print in a large series that Gekko executed. Colour and impression are outstanding, the print is in excellent condition and is on original Japanese album paper. A copy of this print is in the British Museum collection, London.